I'm very fortunate to be able to take a cross-country RV trip and see sights I've only heard of. One of my desired stops was South Dakota since I'm enamoured with the Sioux and a few of my westerns deal with the Paha Sapa (Black Hills.) As we drove through the beautiful mountains of the area, my mind pictured brave warriors among the trees and I immediately saw why they viewed the hills as sacred and wanted to keep them. Firstly, the park is not a federal or state park and is fully funded by the visitors. We also saw Mount Rushmore and learned the carving of those sculptures inspired this second colossal piece of art. I say colossal because the faces on Mt. Rushmore would all fit on one of Crazy Horse's cheek. Korcak Zlolkowsk (jewel-cuff-ski) assisted in the carving of Mt Rushmore in 1939 and was contacted by Chief Henry Standing Bear of the Oglala, asking him to consider carving a sculpture dedicated to the American Indian, in fact the reason in the letter stated a desire to let the white man know the Indian also had heroes. Korcak agreed and with only $174 in his pocket began work in 1948. Lots of blasting has taken place and still there is lots to do. Ruth Ross followed Korcak to South Dakota to be an assistant, and in 1950 they married. They had ten children to make this a family undertaking. Sadly, Korzak died in in 1982 and Ruth ran the foundation they started to assure completion of the sculpture. Ruth passed in 2014 and some of the family members and staff carry on the dream. To give you an idea how big the finished product will be, the head is 87 1/2 feet high, his feather will be 44 feet, his arm will be 253 feet, horse's head 219 feet and the entire piece will be 641 feet long and 563 feet high. I took this information directly from a flyer we received. Last month, we talked about cattle drives in general. It was no easy feat to drive 2000 to 3000 cows up from Texas to the rail heads and beyond. Unlike what we see on television, cattle do not bunch up. They string out one behind the other. With that said, the length of a 1000 head herd could stretch for more than two miles. Walking along, the trip to Kansas could take 25 to 100 days. The trail wasn't easy. There were swollen rivers, droughts, Native Americans who took offense at the cattle moving through their lands. The average miles covered were between 10 to 15 miles each day. With the length of the cattle drive, cowboys or drovers, needed a language all their own. So they developed hand signals that has been adapted from the Plain Indians. Drovers brought their own unique skills and grades of talent to the drive. The best drovers were placed as "pointers". A pointer worked at the head of the herd. 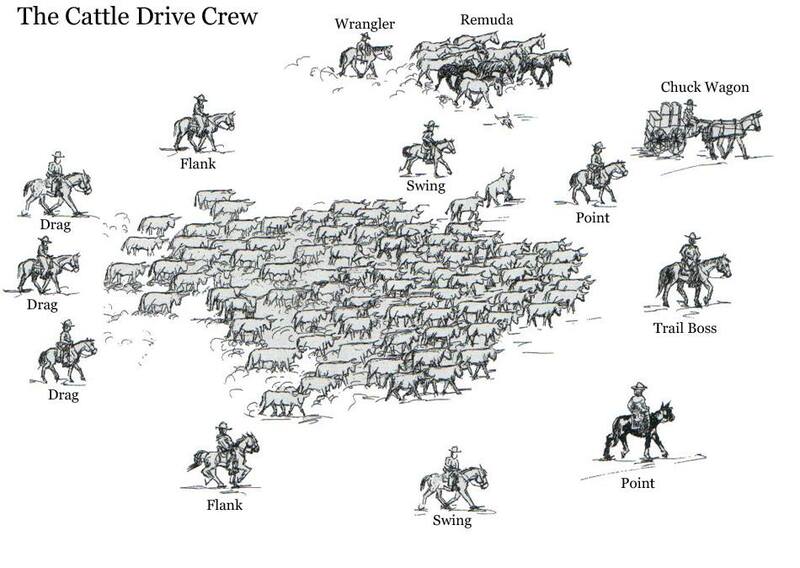 Less talented drovers were assigned positions at the flank, swing positions and the dreaded drag - riders at the back of the herd. Poor guys they ate the dirt churned by the hooves of the cattle moving before them. This is where we bless the cowboy's bandana. It could be pulled up over the nose to filter the dust and dirt at the heels of the herd. Lead Riders. Cowboys who ride on either side of the lead steers and push them in the right direction. The herd will follow. Sometimes, lead steers were used over and over because they were easy to direct. Point Rider. Cowboy at the front of the herd behind the trail boss. They were the leads to which the cowboys push the steers to follow. Flank Riders. Cowboys positioned on either side of the herd. Their job is to keep the herd bunched and tight, no strays. Drag. Cowboys who are stationed at the rear of the herd. Their job is to keep the cattle moving, especially the young cattle that may fall behind. Night Hawk. Cowboys who rode from dusk to dawn keeping the cattle calm and settled. One eye on the cattle, one eye out for trouble. Range or Trail Boss. Manager of the cow herd on the trail. A law unto himself. 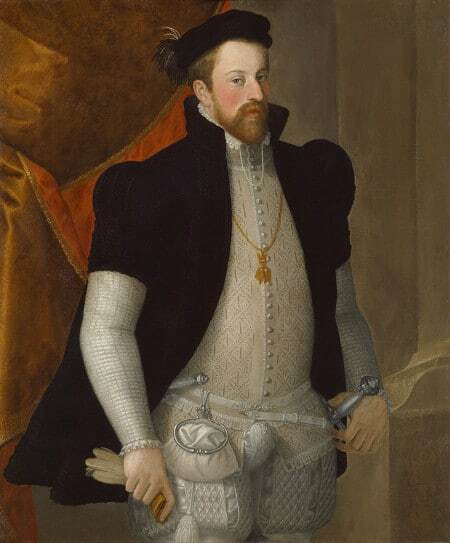 Ferdinand II, Archduke of Further Austria, wears a proto-“pocket” — a bag hung from a belt or tied around the body. He’s also rockin’ a pretty sweet codpiece. This is because the original pockets weren’t like the sewn-in pockets we know today, but rather separate bags detached from clothing. From the 15th until the mid-16th century, men and women carried essential items and currency in a pouch that was typically tied around the waist or hung from a belt. As thieves and “cutpurses” became more of a problem in the 17th century, people began to cut slits in their shirts, skirts, and pants, and tuck their pouches inside their clothing for safekeeping. This practice necessitated making the bags flatter and easier to reach into, so they would be more accessible and not create a significant bulge. As men’s garments became more form-fitting, it became harder to fit a pocket purse between clothing and body. The next obvious step then was to attach the pouches to the clothing itself, and tailors began to sew pocket bags into the seams of men’s breeches, and then into their coats. 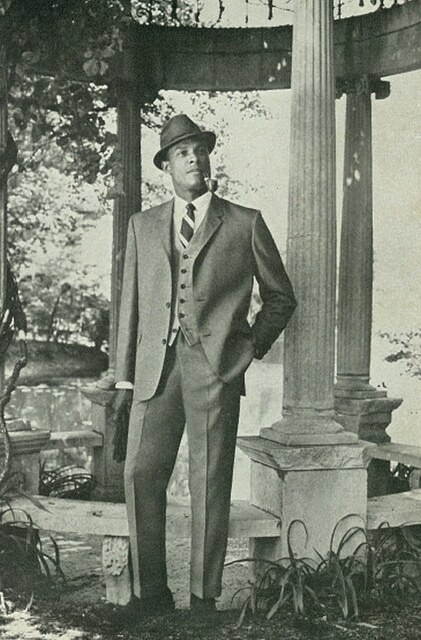 In the 18th century, pockets were added to vests, and in the 1900s, many kinds of men’s garments began to include a wide range of pockets: inside/outside breast pocket, watch pocket, side/hip pants pocket, ticket pocket, etc. 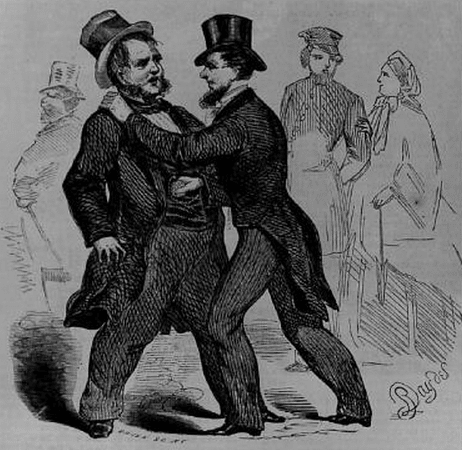 Pickpockets loved the new trend towards men wearing garments with sewn-in pockets. It made it easier to steal their possessions! For their part, women continued to carry pouches under their billowing dresses through the late 1800s. Accessed through a placket hole in the back of the skirt, these sort of internal, reverse fanny packs proved popular with pickpockets, and it became common for women to carry a small drawstring reticule in their hand instead. Attached pockets made their way into some women’s garments, but never quite took off as they did for men, as the more fitted fashions of the 20th century precluded their possibility — lest they ruin the line of the clothes. Women thus largely returned to using outside pockets – i.e., purses and handbags — while men embraced the use of inside, attached pockets. Thus the modern association of bags-and-women, pockets-and-men. Jetted Pockets. 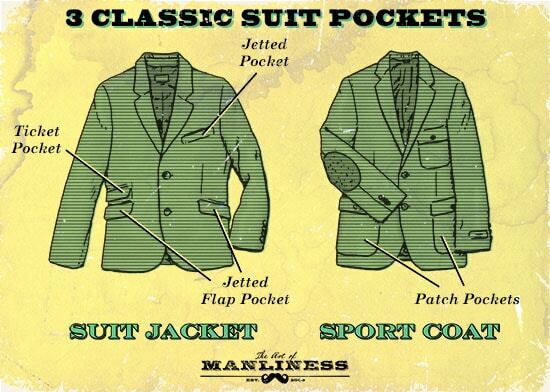 The first jacket pockets were sewn inside the lining or seams of garments, and are called “jetted” pockets. In their simplest form, they consist of little more than a slit; if you look at the left breast of your suit jacket, you’ll likely see an example. Jetted pockets can also have flaps, and this is what you’ll probably see on the bottom hip pockets of your jacket. These flaps came into vogue at the beginning of the 20th century and were originally designed to protect the contents of the inner pouch from falling out and from getting wet with rain. When you went inside, and the flap was no longer in use, you tucked it into your pocket; this tradition is of course no longer practiced, and the flap is kept perennially outside the jacket. Suits that are the most formal, especially tuxedos, do away with flap pockets altogether to give the piece a more streamlined look. Ticket Pockets. Another popular inside jacket pocket was the ticket pocket. Sitting above the right hip pocket, and about half the size, its purpose is easily guessed: it held a gentleman’s train ticket when he traveled by rail. In the 20th century it became known as a change or cash pocket, and it communicated that your suit had been custom tailored. Still today, few off-the-rack suits come with a ticket pocket, and they often must be specially ordered. Patch pockets first adorned hunting and sporting jackets. Patch Pockets. When gents of the 19th century desired additional pockets for storing their odds and ends while out in the countryside, tailors began adding patch pockets to their sport coats. A patch pocket consists of a piece of fabric sewn to the outside of a garment, forming one side of the pocket, with the other side formed by the material of the garment itself. Patch pockets can have pleats that expand their capacity and flaps to protect their contents. The sporting men of yesteryear used them for storing provisions, cartridges, and various other supplies when hunting, shooting, riding horses, cycling, and playing golf and polo. Patch pockets were also adopted by that other quintessentially Victorian English type: the explorer. 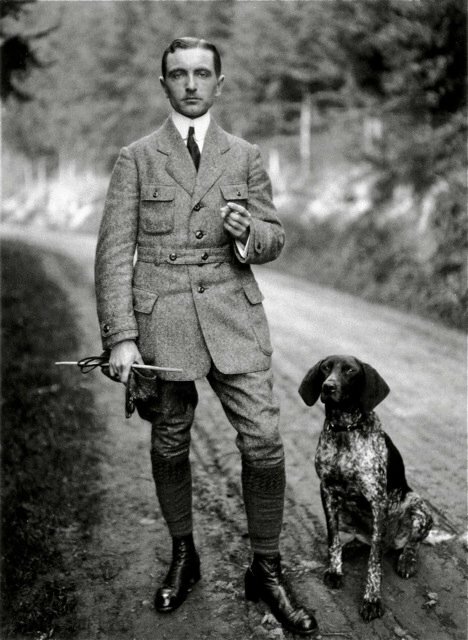 Safari jackets were outfitted with numerous pockets for storing one’s gun cartridges, field glasses, pipe, matches, notebook, etc. Patch pockets, with their rugged functionality, were unsurprisingly adopted by the military for both shirts and jackets. But it wasn’t until the 20th century that the pocket would migrate south, attaching itself to men’s pants, expanding in size, and becoming known as the famous cargo pocket. The British were the first to introduce the pants cargo pocket. In 1938, they adopted a revolutionarily functional and practical combat uniform dubbed “Battledress.” Battledress trousers came with a large map pocket positioned in the front by the left knee, and a right upper hip pocket that held a field dressing for first aid. 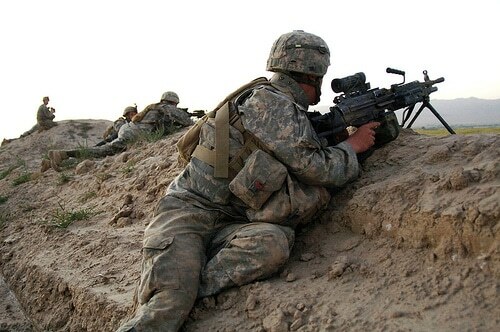 The cargo pocket was introduced to the States by Major William P. Yarborough, a commander in the 82nd Airborne Division. Dissatisfied with the current paratrooper jump suit — which consisted of a one-piece coverall worn over a regular infantry dress — Yarborough set out to create a uniform that would be more functional for their unique mission and distinguish the airborne forces from other soldiers. Yarborough developed special jump boots, as well as a fatigue uniform that included extra large pockets on both top and bottom — 4 on the jacket, 2 on the pants. 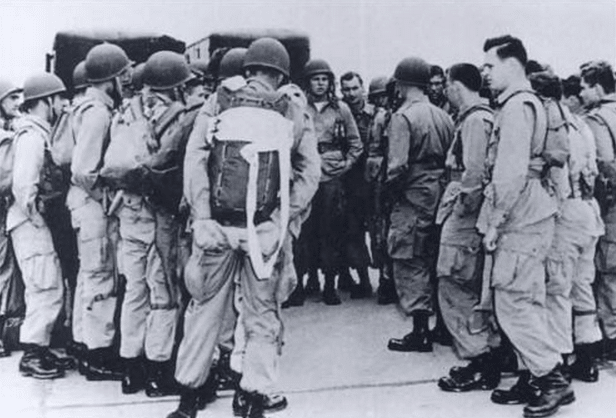 The breast pockets were slanted down and towards the center to give the paratrooper easier access when he was wearing his parachute harness, and the cargo thigh pockets expanded to hold ample supplies. The jacket’s collar also included a unique hidden dual-zippered knife pocket, which held a 3-inch switchblade. Should the jumper become caught in a tree, the knife could be used to cut himself free of parachute lines and the harness itself, though he was trained to employ it as a weapon as well. Some paratroopers also used the knife to cut a section from the parachute’s fabric, to be turned into a souvenir scarf commemorating the mission. A paratrooper already shouldered 100lbs of equipment, and the jump suit’s pockets were handy for holding all the things that couldn’t be fit into the other bags and belts he had strapped to him. Pockets were often stuffed with socks, rations, and grenades, and the average paratrooper carried about 9lbs of gear in them. 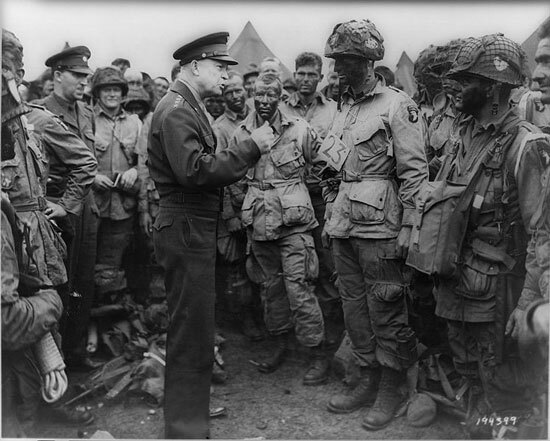 Paratroopers’ pockets were in fact so heavy laden, that when they jumped on D-Day, the shock of the chute opening ripped the seams of the pockets open, spilling their contents all over Normandy. The paratroopers reinforced the seams with patches on subsequent jumps. 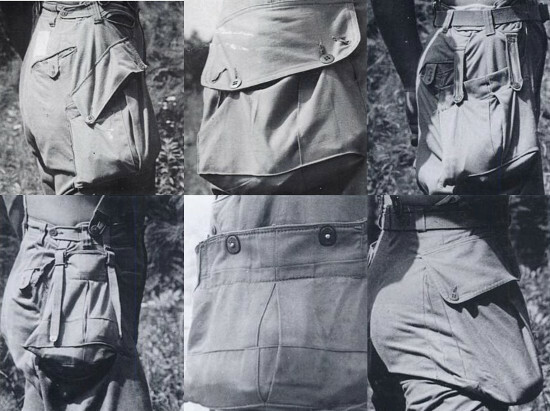 During WWII, the military experimented with a wide variety of cargo pocket designs. Some of the pockets were so big, and carried so much gear, that suspenders were necessary to keep the soldier’s pants up. 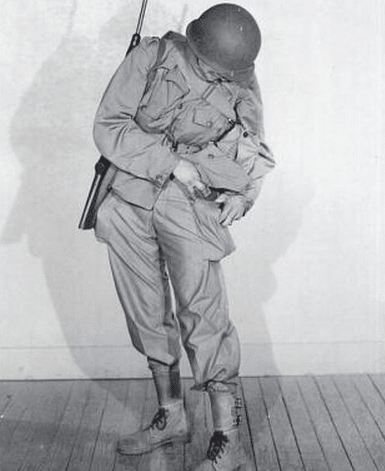 The design they eventually chose for the M-1943 uniform was unfortunately hard for the solider to access. The Army, seeing the utility of the paratrooper jump suit, issued a new uniform in 1943 for the rest of its troops that included trousers with two large cargo pockets worn on the side. These cargo pockets were discontinued a few years later, and replaced with front patch pockets. They wouldn’t be re-introduced until the 1960s, when none other than William Yarborough (now a lieutenant general), redesigned the military’s jungle fatigues for combat in Vietnam. After a hiatus, cargo pant pockets returned to combat fatigues during the Vietnam War. Drawing inspiration from the old paratrooper uniforms, he created a jacket with 4 large pockets, and trousers with 7, including two side cargo pockets. There was even a pocket within the left cargo pocket — though what it was supposed to be used for remained a mystery to the men. It was intended for a survival kit that was never issued; soldiers instead used it for cigarettes and small mementos. Today’s Army Combat Uniform (ACU) includes 5 pockets in the blouse, and 8 in the pants. In the modern day, cargo pockets have of course found their way into civilian dress — becoming a ubiquitous part of men’s shorts and pants. But given the rule of thumb mentioned above — the more pockets a garment has, the less sleek/formal it is — it’s inadvisable to don cargo pants and shorts in situations where you want to appear more sharp and stylish. Pockets add bulk to a garment, even when they aren’t filled, and appear quite bulky and misshapen once packed with odds and ends. Cargo shorts and pants are thus best worn as intended — as functional attire for tactical, outdoor, and sporting pursuits. Given the rich history of the humble pocket, it’s not surprising we’ve become so attached to their attachment. Men’s pockets have for centuries held the components of millions of adventures and memorable moments: the handkerchief offered to a sad, but darn cute lady; the money used to buy a favorite book; the ticket for a cross-country adventure; the knife that saved a life. This lack of fussiness likely has much to do with the persistence of pockets’ popularity amongst men, and the fact that, at least in America, the externally carried bag has yet to make a comeback. Ridicule around “murses” is a bit much though, in my opinion. We’re in a cultural place where a man can carry a medium to large bag, or whatever fits in his pockets, but nothing in-between. Which is a little odd when you think about it. Yet I think I do understand the philosophy behind this mentality. You either travel super light and nimbly, or you’re full-on prepared, with the kind of gear and essentials you’ll need a full-sized daypack to carry. I don’t know if this mindset is completely rational, but it makes its own kind of manly sense. With that in mind, next month we’ll be running a post on what you might consider carrying from day to day (the art of EDC! ), and later in the year we’ll devote primers to some of mankind’s favorite carryalls, such as the messenger, the briefcase, and the satchel. 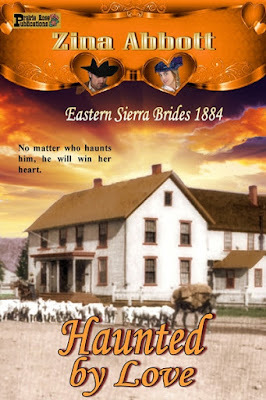 I’m very excited about the release of my latest novella, Haunted by Love, that came out yesterday. I am particularly pleased with the cover done by Livia of Prairie Rose Publications. For my other book covers, she has used my photographs of the Lundy and Bridgeport area for the cover backgrounds. For this cover, I wanted to use an 1877 photo of the Leavitt House, the stagecoach inn in Bridgeport where at least half if not more of the story takes place. The good news was, because the photo was taken before 1877, it was not subject to copyright laws. The bad news was, the photo was in black and white. Using my photo program, I spent hours one day “colorizing” the photograph. This is version “d” where I worked on the roofline and buildings, but the man on horseback, the sheep and the mule were not even touched yet, let alone the window sashes. The final version is letter “p” which gives you an idea of the number of steps I took as I colored a section, and then saved that version. More than once something did not turn out right and I had to go back to an earlier version in the process and start all over. After all was said and done, I still missed a section of eve on the roof line. Livia took this image, chose the essential elements and worked her magic to come up with a great cover. A big part of the plot deals with the Leavitt House owned by Hiram Leavitt and his wife Eliza, the story takes place in autumn, and one of the characters is the White Lady, a ghost known to have appeared many times in room 16 of the inn. The color and design of the cover sets the mood. Turned out by her guardian, Hazel Jessup is sent to live with her sister she hasn’t seen in over a year. 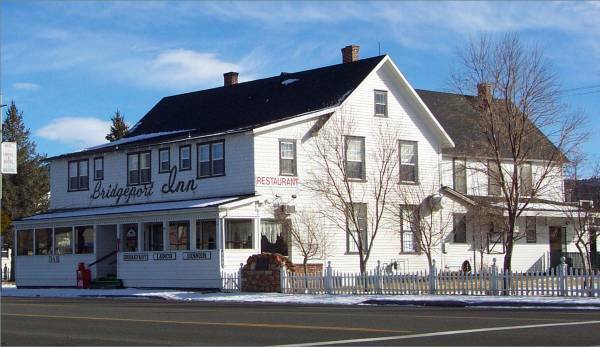 A night spent in the Leavitt’s inn puts her in contact with the famed specter of the White Lady, a lonely ghost whose name is Charlotte. Charlotte speaks of a man who is waiting to love her—can it be Luther Caldwell, the handsome freight wagon driver who is seeing her to her sister’s home? Until 5:00p.m. PDT on Friday, July 22, 2016 you still sign up on my publisher’s blog for a chance to win a copy of Haunted by Love. Just CLICK HERE to add your comment to that blog. Zina Abbott is the pen name used by Robyn Echols for her historical novels. Her novel, Family Secrets, was published by Fire Star Press. Her novelette, A Christmas Promise, and the first four novellas in the Eastern Sierra Brides 1884 series, Big Meadows Valentine, A Resurrected Heart, Her Independent Spirit and Haunted by Love were published by Prairie Rose Publications. Her novelette, He Is a Good Man, was published in the Lariats, Letters and Lace anthology. Please visit and follow the Zina Abbott’s Amazon Author Page by clicking HERE. After moving to SE Oregon we had several locals ask if we’d been to Malheur Cave. We told them no and asked where it was. They gave us directions because most maps don’t show the cave and there aren’t any signs. The property is privately owned by the Masons. They only use it once a year and allow those who can find the cave permission to enter. Walking through the eight foot high entrance, the first thing you smell is rodents. They live under the rocks off to the sides in the cave where daylight penetrates. As the light dims and darkness covers you like throwing a blanket over your head, the smell of rodent vanishes. Musty air fills your lungs and you fumble for the switch on your flashlight. Why would anyone want to go into this cave? It’s large. The ceiling is 15-20 feet over your head. The walls are a good 40 feet apart. It is a large cavern with silver spidery lines on the ceiling and walls. The trail deeper into the cave is uneven and at times littered with rocks. But the reason people walk the half to three-quarters of a mile (depending on the time of year) is to see the lake. It is smooth, clear, and around 50 degrees all year round. If you know me, after my first visit to the cave I had to research. 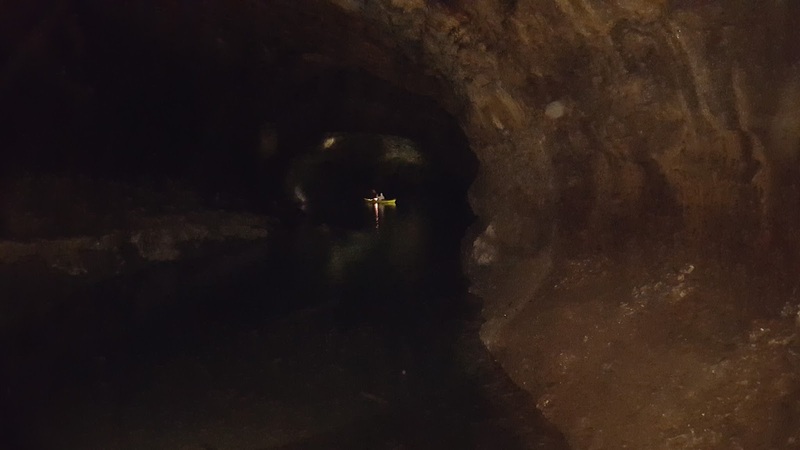 I discovered the cave was first used by the Paiutes. Some bands wintered in the controlled climate of the cave. There is also a story that the Paiutes learned the Bannocks planned to raid them. The Bannocks outnumbered the Paiutes. Using their knowledge of the cave and its hidden water source, the Paiutes stored food, bedding, and wood in the cave and then barricaded the front with rocks. When the Bannocks arrived they couldn’t get to the Paiutes. Thinking they could wait them out, they soon gave up and went back to their territory. If you'd like to see some traditional Paiute baskets and cradleboards and learn how they are made check here. Because of this rock barricade it was years before a Whiteman discovered the cave. Each time we take guest to see the cave, I come back with another idea for a story. It was my first trip to the cave that inspired a scene in my new release, Brody: Letters of Fate. 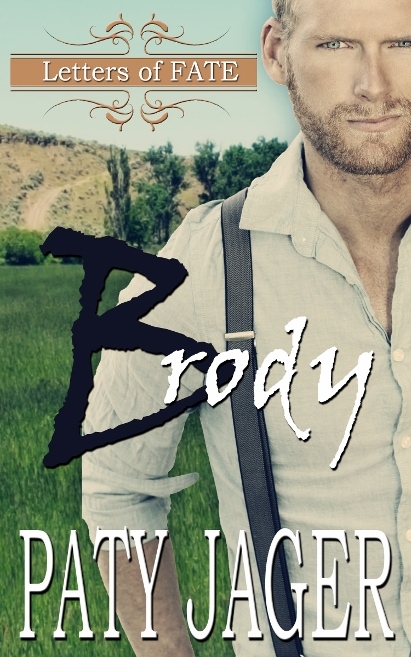 Historical western filled with steamy romance and the rawness of a growing country. A letter from a grandfather he’s never met has Brody Yates escorted across the country to work on a ranch rather than entering prison. But his arrival in Oregon proves prison may have been the lesser of two evils. A revenge driven criminal, the high desert, and his grandfather’s beautiful ward may prove more dangerous than anything he’s faced on the New York docks. 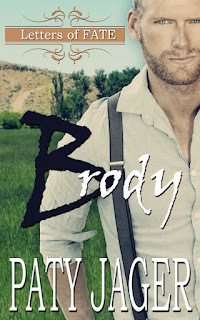 Lilah Wells is committed to helping others: the judge who’d taken her in years ago, the neighboring children, and the ranch residents, which now includes the judge’s handsome wayward grandson. And it all gets more complicated when her heart starts ruling her actions. 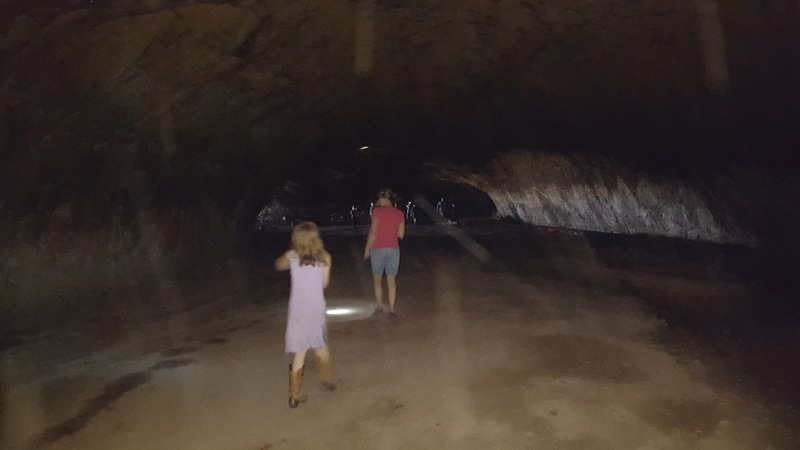 In case you were wondering about the silver spidery lines in the ceiling and walls…during my research I discovered it is called cave slime and is made from the minerals present in the dirt and rocks lining the cave. 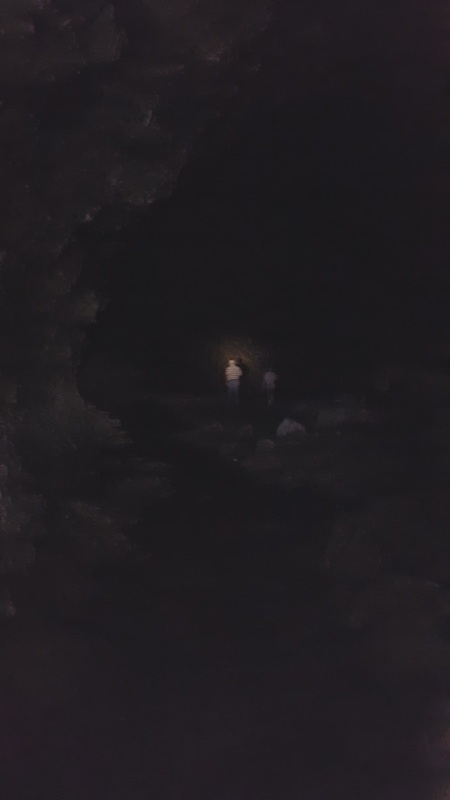 Have you ever been in a cave? 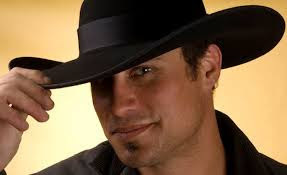 Paty Jager is an award-winning author of 25+ novels and over a dozen novellas and short stories of murder mystery, western historical romance, and action adventure. She has garnered a RomCon Reader’s Choice Award for her Action Adventure and received the EPPIE Award for Best Contemporary Romance. All her work has Western or Native American elements in them along with hints of humor and engaging characters.